Sunday School plays an important part in the faith development of children. Students develop familiarity with the key stories and central themes of the Bible and experience themselves as an important part of the Christian community. In class they experience and are encouraged to practice personal study, prayer and worship in ways that are appropriate to their ages. 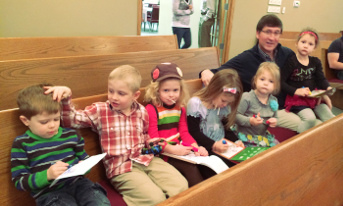 Sunday school classes are offered for children and youth at 9:30 a.m. each Sunday. emphasize hearing and pondering the Bible story. use activities that grow out of the Bible story. provide a setting in which each child feels loved. help children explore their questions of faith. Children's classes use Shine materials published by Faith and Life Resources. Children are encouraged to participate in the Shalom Readers program sponsored by Central Plains Mennonite Conference. We desire that youth will become aware of the religious, social, and cultural issues that people face in our age that are, in fact, ageless. By reading these books, questions will be raised about international events, world history, and God’s vision that will promote a discussion about faith in Jesus and what it means to be a disciple of the risen Christ in today’s world.